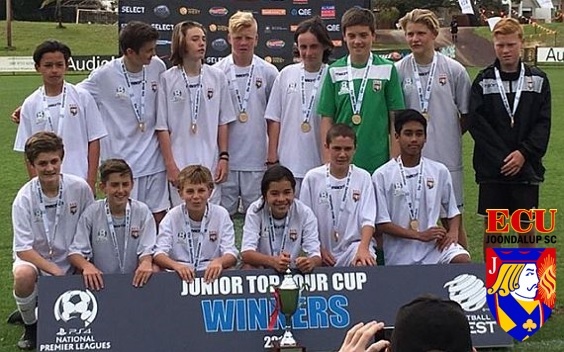 ECU Joondalup under 14’s held their nerve to beat Sorrento on penalties to win the PS4NPLWA Top Four Grand Final. The Jacks led when Khuiral made a bursting run down the right, and he cut the ball back to Ethan Sauire who made a darting run into the box, and he fired into the roof of the net. It looked like they would win it normal time, but Sorrento levelled from the penalty spot, but the youngsters win the tense penalty shoot-out. “It was a testing game due to the nerves of the occasion,” assistant coach Jesse Hesford said. “The hard work the boys have put in at training soon showed and we got into our stride, however the final ball was never there. “We had progressed through the finals games with two narrow 1-0 wins previously and it looked much the same before conceding a sloppy penalty.